Scenes from Aiea Loop Trail in Hawaii. You want to make sure you have FUN when you’re out on the hiking trails! And that means staying SAFE! Because if something goes wrong, that is a sure way to make your hike NOT fun very quickly! You’re outdoors, so there’s no way to completely prevent something from going wrong, but there are lots of things you can do to minimize the risk. And so… here are some hiking tips to keep in mind! These are hiking tips based on those offered by Hawaii State Parks and the State of Hawaii’s Division of Forest and Wildlife. This page highlights some points that are found in this brochure provided by the State of Hawaii. 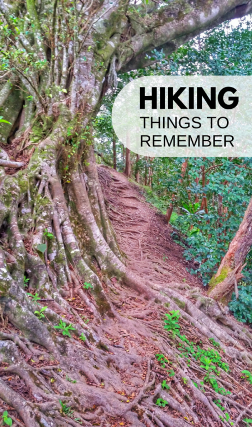 While some of these tips are specific to hiking trails in Hawaii like these, the overarching themes covered in these hiking tips are things to think about when you’re hiking as a beginner (or experienced hiker for that matter!) no matter where you’re doing your day hiking. Why should you read these hiking tips? Because it may save your life or someone else’s, prevent an injury, or maybe just save you from significant embarrassment! Rescue personnel in Hawaii are now more frequently responding to missing or injured hikers than ever before, indicating the need for hikers to be better informed and prepared. Rescuing careless or reckless hikers places others at risk. …says the State of Hawaii! Most accidents happen when hikers leave the established trail and disregard warning signs. And in Hawaii, there are plenty of opportunities to go off the marked trail. It will be tempting, because you’ll see others going off the trail like on one portion of the Diamond Head trail (see the very last picture there), or to go on a sort of scavenger hunt to find a plane crash on the Aiea Loop Trail. Staying on the trail greatly reduces your chances of having a serious fall or getting lost. Hawaiian forests are not like mainland forests. The growth is very dense, and it is easy to become disoriented. Thick overgrowth can mask dangerously steep drop-offs. Thin, sharp lava rock can crack beneath your weight above deep holes or lava tubes. If you decide to proceed despite going off the marked trail, be sure that you have evaluated the risks for doing so. Frequently, people who get into trouble are alone. In case of an emergency, your partner’s help can be invaluable. Hikers separated from their partners are more likely to make a wrong turn or lose the established trail. Keep track of each other, and regroup periodically, especially near junctions or when the trail gets obscure. Monitor everyone’s condition. Dehydration, heat stroke, hypothermia, and fatigue can hit even experienced hikers. Climbing waterfalls and following narrow ridge lines or gulches off the trail can place you in danger. Rock climbing is extremely dangerous due to the crumbly and porous nature of the volcanic rock. There have been fatal accidents from crumbling rock. If your adventurous spirit cannot be tamed because you see pictures of other outdoor adventurers successfully rock climbing, at the very least, be sure you use a crash pad like this one. When hiking into valleys or crossing streams, be mindful of rain conditions along the mountain top or ridges that can suddenly raise the water level in the stream. Use extreme caution if attempting to cross a swollen stream. Rushing water is very powerful. It is better to find an alternative route, or wait until the water subsides. Sunny and clear mornings are sometimes followed by rain and wind later in the day. Flash floods are dangerous possibilities in the narrow gulches. the possibility of getting caught in the dark. Know your turnaround time and stick to it to allow enough time to return. If you’re caught by darkness, stay put unless you are very familiar with the trail. Even if you don’t intend on staying out past dark, it’s a good idea to carry a mini tactical flashlight like one of these in case you do find yourself out on the trails past dark unplanned. You just never know what’s going to happen out there! Let someone know which trail you plan to hike on, and when you expect to return. If something should go wrong, rescuers will have accurate information on where to start searching. Learn about the trail so you will know the route, where to start, and degree of difficulty. Compare your level of fitness, ability, and experience with the trail description. Be practical and realistic. There are a wide variety of trails in Hawaii, so pick one that suits your level. Dress in layers so you can protect your skin from the intense tropical sun. A hiking hat like this one, sunglasses, and sunscreen are recommended. Hiking shoes or hiking sandals offer traction and ankle support to prevent slipping and injuries on muddy trails and slick or sharp rocks. Light rain gear is good to carry because of the quickly changing weather conditions. You may also be able to find a $1 disposable poncho in the camping section of your local super store that you can pack in your hiking backpack as a back-up. item to have in case of emergency. You will want to keep your hands free while hiking. This backpack is durable with lots of good features, although it’s on the expensive side. Otherwise, have a look at one of these daypacks. To go on the more minimalist side, have a look at one of these waist packs for hiking. WATER! In tropical weather, dehydration can become a serious problem. This hiking backpack with water hydration pack can work out well! Also see the list of what to pack for Hawaii outside of hiking! Here are also more tips for what to pack for a day hike. Hawaii has a unique natural environment with many rare native plants and animals. Unfortunately, these fragile native ecosystems are under constant threat from non-native weedy plants. One way these weeds are spread is by seeds mixed in with mud on hiking boots and gear. You can minimize this impact by scrubbing your boots after every hike, and start each hike with clean boots. Leptospirosis is a bacterial disease that can be found in Hawaii that is transmitted from animals to humans. The bacteria can survive for long periods in fresh water and mud. It can enter the human body through the eyes, nose, mouth, and broken skin. Do not drink untreated stream or lake water. If you have flu-like symptoms 2-20 days after hiking in wet or muddy areas, see your doctor immediately. Leptospirosis can be fatal if left untreated. Trailheads are targets for theft! Any valuables should not be left inside your vehicles, even in the trunk. While these are all serious hiking tips, they are designed to keep your hiking experience fun and minimize the chances of your hike turning into a miserable experience! For the full list of hiking tips from Hawaii State Parks, see the brochure! Now it’s time to start planning your hikes in Oahu!